I’ve fallen asleep. Left you alone in Gethsemane again. The sinner’s engagement with Moses, Isaiah, and Jesus—the way it compresses and collapses history—is typical of other moments in the collection. The sinner draws from a sacred past, unable to disassociate himself from the Law and Christ, yet he remains ambivalent about its legacy—as if he is at odds with what to do with a Law that makes him a sinner and a Christ that makes him clean. History, in a sense, becomes something to wrestle with—an inheritance from God that compels the heir to struggle with difficult, vital choices. And so we sit, sharing a train and a century. don’t mistake it for emptiness. we hid cities inside you. Get drunk now on your courage. Boast Loud in the fort of the bloody deed. Significantly, it is here, in the final lines of the poem, that the point of view shifts to first person plural—a move that asserts a kind of collective ownership of the murder. The poem itself remains ambiguous as to who is speaking. Have Old Bishop’s murderers become Mahan, or does the “we” refer to all Mormons, newly initiated into the secret? Or is it the contemporary Mormon reader who is waking in the middle of the night, haunted by Old Bishop’s ghost? almost as quickly as he throws each stone. that we’d share their elusive overseas attractiveness. Importantly, the poem follows this image with a question that begs us to consider how our shallow memories create mental distance between us and the history of the physical spaces we inhabit: “Are we even in this valley/which our bodies share with the past?” The poem seems to suggest that we do not, the Cinemark (and its product) providing a kind of imaginative transport away from the tragedy of Old Bishop and the landscape that would have been familiar to him and his murderers. We are not in the valley, that is, because we are distracted from—or we simply ignore—the ways the past is inscribed upon it. 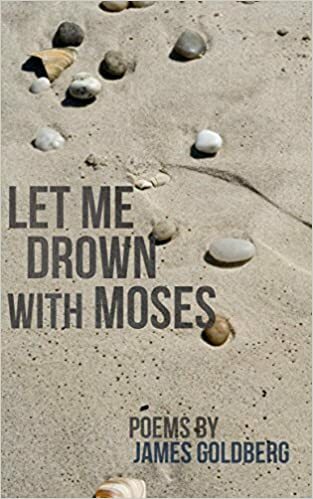 While history is never far from any poem in Let Me Drown with Moses, the collection does treat other subjects and themes. In a series of personal poems, for example, it reflects on love and family. Other poems treat God, creation, faith, and devotion. An undercurrent that runs through each poem in the collection, as a kind of counterpoint to its reflections on history, is a sense of limbo brought on by agency. Throughout the collection, speaker after speaker pleads with God for forbearance, for a sign that all is not lost, expressing a desperate hope that atonement can overcome the tangible and intensely overwhelming challenges of the fall. There’s nothing that I fear like you. for this faith we share. of a wide open world. when the roof is in good, solid shape. And my friends start jumping off. The poem, like the collection, begs for more time. Both are invitations—pleas—to look around, to see the beauty of the house, and appreciate all it took to build it. Great review! Goldberg’s book is my latest acquisition after Amazon offered me a sample poem out of the blue. I was struck and decided to purchase it before I even knew Goldberg was LDS. Some of the poetry is easily digested, other poems have a lot of raw fiber that calls for slow chewing and might get stuck in your teeth, making you wonder if you need dental floss to strip it out or whether you should just let it fester because that’s where it belongs. For now I’m letting it fester.